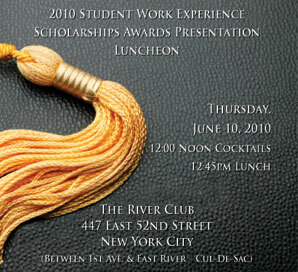 New York, NY: May 28, 2010 – The Council’s annual program of Student Work Experience Scholarships for 2010 will be celebrated this year at an awards luncheon to be held at The River Club in New York City on Thursday, June 10, 2010. Council President Dennis D. Swanson, in releasing details of this year’s scholarship awards, said "We have operated this successful and admired Scholarship Awards program for the past 26 years. Opportunities are provided through the program to student undergraduates from third-level educational institutions on the island of Ireland to travel to the United States and to work temporarily in American corporations. The scholarships provide work assignments in business corporations of differing sizes in America. These assignments are linked to the fields of study and academic disciplines which the undergraduate scholars are pursuing in Ireland." Typically, the Council's scholarship candidates are undergraduate university students in their penultimate or junior year of college – usually, the third year of their four-year bachelors' study programs. The term of the scholarship runs from late May/early June thru September each year. The Council partners on this program with Fordham University for those Council Scholars based in New York City – these are accommodated in the residence halls of the Lincoln Center campus of the college during their time in Manhattan. "The interest of the Council in managing participation in this program is to highlight the excellent educational infrastructure which has been developed throughout the island of Ireland. Universities in Ireland, North and South, participate. This year colleges in Cork, Belfast, Dublin, Galway and Limerick will be represented in the program", Mr. Swanson noted. Mr. Swanson added "The Council, for its part, provides a cash award toward each student's travel expenses. The project-oriented employment assignments, which the Council arranges for the students, enhance their learning experiences in America, linked as they are to their field of study. We are indebted to the Universities in the Republic of Ireland and in Northern Ireland for their support and assistance in mounting this program." Seán Flynn who hails from Ennis, County Clare is studying for a Bachelor of Commerce degree in the J.E. Cairnes School of Business & Economics at the National University of Ireland Galway. He will work at Allied Irish Banks in New York. John McKenna is a native of Silverbridge, Newry, County Down and is a student at Queen’s University Belfast where he is pursuing a degree in Chemical Engineering in the School of Chemistry and Chemical Engineering. John will travel from Northern Ireland to New Jersey to take up his work assignment at Council member-firm Merck & Company. Niamh Callaghan is from Lower Kimmage Road in Dublin and is enrolled at Trinity College Dublin studying Economics having finished the third year in a four-year degree course. She will travel to New York City to take up her appointment to work at Mutual of America in New York. Greg McSweeney, from Bishopstown, County Cork, is studying for a Bachelor of Science degree in Chemical Science at University College Cork. He has been nominated to work with Pfizer, Inc. in New York City. Paul Constant, whose home is also in Bishopstown in County Cork, has been chosen by the University of Limerick to participate as a Council Scholar this year. He is pursuing a Bachelor of Science degree in Finance and Math and will travel to New York City where he will work in the world headquarters of News Corporation. The Ireland-U.S. Council was founded in 1963 by American and Irish business leaders. Its principal objective is to encourage closer business links between Ireland and America . The Council operates a variety of scholarship and internship programs, stages seminars and hosts frequent events in Ireland and in America aimed at building business bonds and commercial connections across the Atlantic between the island of Ireland and the United States . The Council is not-for-profit corporation with headquarters in New York City and a permanent office in Dublin.